Mouse anti Human FSH alpha antibody, clone F1 (BGN/F62/01) detects the alpha subunit of Follicle-stimulating hormone (FSH alpha). FSH is secreted by the pituitary, and is a member of the glycoprotein hormone family which includes Human chorionic gonadotropin (hCG), Luteinizing hormone (LH), and Thyroid stimulating hormone (TSH). These hormones are all structurally related and contain a common alpha subunit non-covalently bound to a hormone specific beta subunit, which determines receptor specificity. Both of the subunits are necessary for hormone action. Native human follicle stimulating hormone.  0100-0662B is suitable for use in a two site assay with 0100-0663 bound to the solid phase and this antibody for detection. When tested in a sandwich ELISA the 50% OD was observed at an antibody dilution of 1/160K and the end point titre at 1/5M. 0100-0662 is suitable for use as a detection antibody in a sandwich ELISA assay with 0100-0663 as the capture antibody. Sohn, J. et al. (2003) Orientation of follicle-stimulating hormone (FSH) subunits complexed with the FSH receptor. Beta subunit toward the N terminus of exodomain and alpha subunit to exoloop 3. J Biol Chem. 278 (48): 47868-76.